Plant Raisers is the foremost UK plant propagator for the horticultural sector, specialising in protected crops and ornamentals. 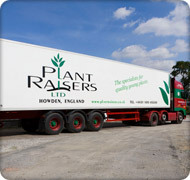 Supplying professional growers throughout the UK and Europe. Our team have a vast amount of experience and we continue to lead the way in new techniques and developments. 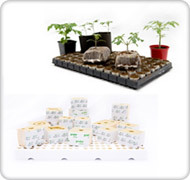 Plant Raisers is the largest tomato plant propagator, cucumber plant propagator and pepper plants propagator in the U.K. and the only one to have a quality system certified to conform to Global Gap. We are situated in the North East of England just 3 Kilometres from the M62 corridor and only 30 minutes from the M1 with excellent access to the UK and ports. Our modern nursery comprises 34,000 sq.m. of venlo design glass which can be heated by our bio-mass, gas or oil hot water boiler systems giving flexibility and security. Modern computer systems control every aspect of the nursery environment, which is split into 19 individual environmental sections plus germination rooms, allowing complete and individual control over each. Supplementary lighting fitted throughout the whole nursery. Pure CO2 enrichment, thermal shade screens and humidity control are fitted enabling optimum growing conditions to be maintained at all times.